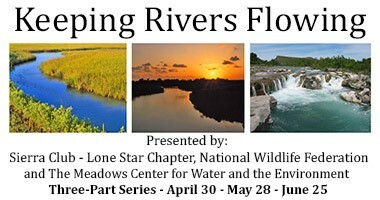 “Keeping Rivers Flowing: Innovative Strategies to Protect and Restore Rivers” is a 3-part webinar series designed to inform interested persons about strategies to ensure the future health of Texas’ rivers, bays and estuaries. Drawing on practical experience from here in Texas and around the world, speakers will discuss innovative approaches for ensuring that rivers, bays and estuaries continue to get the flow needed to protect water quality and support healthy fish and wildlife populations. Without affirmative strategies to protect flows, the natural heritage embodied in Texas’ rivers, bays and estuaries is at risk. The first webinar provided an international perspective from Brian Richter on the state of rivers and what is being done to protect and/or restore these vital resources. Texas water policy experts Myron Hess and Andy Sansom highlighted why this issue is important in Texas, what is at stake, and what types of approaches might be taken to keep Texas rivers flowing all the way to the coast. The second webinar in our series examines on-the-ground techniques used by Trout Unlimited’s (TU) Western Water Project. TU works with ranchers and farmers to find mutually beneficial solutions to increasingly complex water demands for water from fish and people in the Rocky Mountain West. Their mission is to “restore healthy stream flows and habitat in some of the West’s best places.” Russell Schnitzer, TU’s Ag Policy Advisor, joins us to discuss this compelling project. Mary Kelly with Parula LLC discusses how water markets can provide environmental flow solutions and Myron Hess from the National Wildlife Federation highlights opportunities to protect and restore Texas rivers using strategies from TU and discusses Texas policy opportunities and challenges. The third (and final) webinar in our series takes us to Australia’s to learn about the historic Murray-Darling Basin agreement. The M-D Basin Plan provides a coordinated approach to limit water use to levels that preserve environmentally sustainable levels of river flows. Mr. Young covers what policies and agreements had to be put in place to develop and make this program work and digs into the environmental components and how it is working in practice. Jennifer Ellis with National Wildlife Federation explores opportunities for application in Texas and presents possible solutions for Texas. Technical Note: The webinar ended 5 minutes early (during Q&A) due to technical difficulties. The presenters were able to provide written answers to the questions that we were not able to address during the webinar.